Chris Bonacker founded C. Bonacker Excavating in Eureka, Mo., last July. Not many successful businessmen plot their career accurately in fifth grade. Chris Bonacker knew exactly what he wanted to do. Now, at 32, he is right where he wants to be — running his own excavating firm. 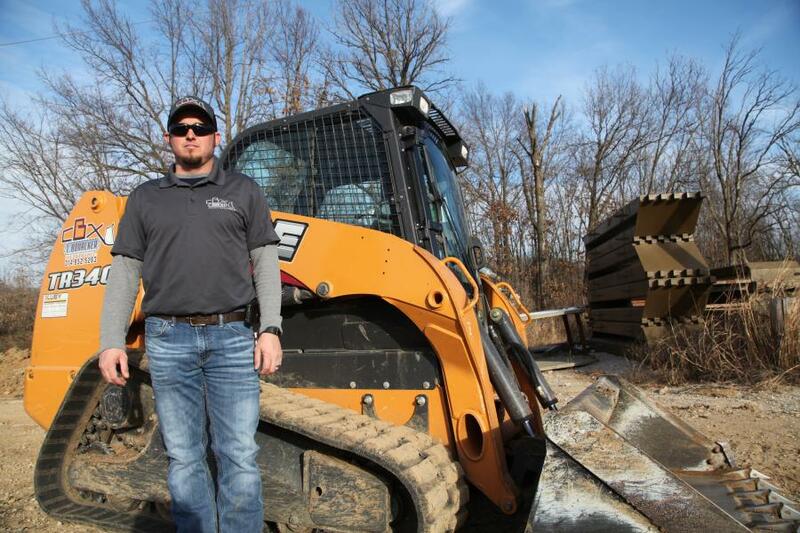 “I'm just trying to live the American Dream,” he said, “and provide for my family, doing what I love to do.” After working in excavation in his late teens and early twenties, Bonacker founded C. Bonacker Excavating in Eureka, Mo., last July. He concentrates mostly on residential work, from digging foundations to finish grading. “I grew up on a dairy farm, so I've been on equipment since I was knee high to a bean pole,” said Bonacker. While he has operated Case skid steers since his youth, his first experience with a Case compact track loader was a TR320 in 2012. He currently owns a Case TR340 compact track loader, a CX36 compact excavator and a CX80 minimum swing excavator. “I've been very pleased with all three of them,” he said. Bonacker relies on the track loader mainly for finish grading and material handling, where the radial lift design comes in handy both for earthwork and pulling materials off his trailer (the radial design generally offers the greatest reach at eye level). As compact track loaders have proliferated, manufacturers developed a wide array of frame sizes and operating capacities to meet industry needs. Bonacker settled on the 10,000-lb. TR340 (90 horsepower, 3,400-lb. rated operating capacity (50 percent tipping load)) for its ability to meet his jobsite needs while also being transported to job sites easily with his pickup truck. 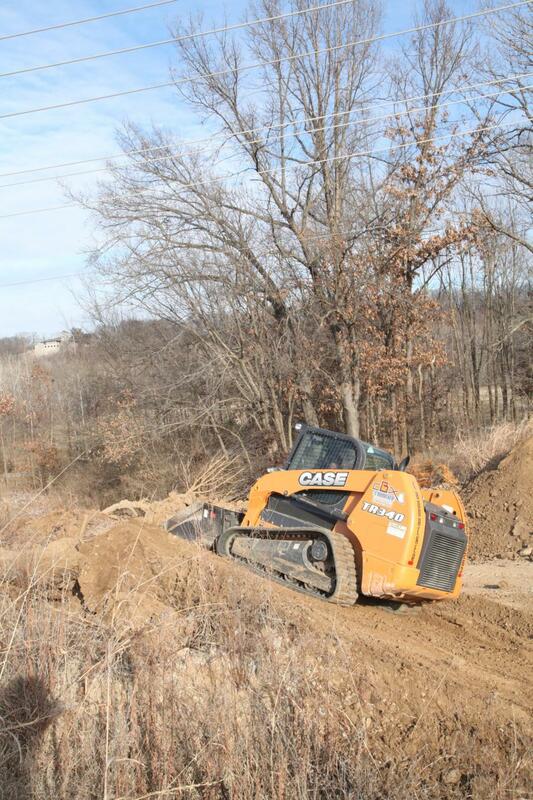 The varied terrain of eastern Missouri is custom made for compact track loaders, providing excellent stability and performance — both when working on slopes and in boggier materials. Bonacker also touted the machine's speed, both when grading and carrying a full bucket of material. Visibility on a residential or small commercial work site also is critical to ensure the safety of all workers and equipment on site. The TR340 features a low, sloped rear hood, and excellent visibility out the side windows and front door of the machine. “Great visibility, whether it's out the side windows or being able to look behind you. The engine compartment is not half way up your back window to where you can't see,” he said. Bonacker also outfitted his track loader with Ride Control, a feature that dampens arm movement when traveling across varied terrain in order to retain more material in the bucket and provide a smoother ride. “To be able to push that button and get a bucket of rock and carry it across, whether it be a parking lot or a job site, and [only] lose three or four rocks versus several hundred, or half your bucket because you're bouncing over stuff, is a big thing to me,” he said. Equipment dealers occasionally look upon startup businesses with skepticism. Bonacker was familiar with Luby Equipment, Fenton, Mo., from his previous job, and approached the dealer when it came time to ramp up his fleet and make the jump into business ownership. As he approaches the conclusion of his first year in business, Bonacker appreciates the good fortune he has had. He sees growth in his future, but he's more dedicated to managing the quality of the product out in the dirt and the service he provides his customers. George Mac Intyre, is the product manager — skid steers and compact track loaders, Case Construction Equipment.